Those in favour of a third runway and sixth terminal at Heathrow often cite expansion as the only way the world's busiest international airport can continue to compete with its rivals on the European continent. While in passenger terms, Heathrow continues to be Europe's dominant airport, its owners BAA argue that unless its infrastructure is upgraded, then it will fall behind the airports of Amsterdam, Frankfurt and Paris. When Hounslow Heath opened as the new London airport in 1946, few who checked in at the temporary tented village before boarding their converted WWII bomber could have envisaged it becoming a global aviation hub. Its development since then has never really stopped. For almost every decade since, a new terminal has opened at Heathrow - from the first in 1955 (now known as Terminal 2) to Terminal 5 next year - but its two parallel runways have been in use since the 50s. Having two runways puts Heathrow at a disadvantage over its competitors. With one in use for take-offs, and one for landings, the number of aircraft that can land and depart remains constrained. But the size of the site, the smallest of the European "big four" at 1214ha (3000 acres), means there is no chance of developing another runway within the airport's boundaries. Therefore, the only way Heathrow could match its rivals is to build in a densely-populated area - and it is this which engenders vehement opposition. 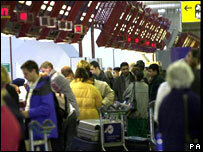 Despite this, Heathrow is the world's third busiest airport (its owners say it is the world's busiest international airport) with 67.7m passengers passing through its four terminals in 2006. The grand-daddy of Europe's biggest hubs at 87 years old, Amsterdam Schiphol is praised by travellers for its integrated terminal. While a change at Heathrow could see a traveller making an underground hike to get to their next flight, Schiphol has always played on its easy connections. Development at Amsterdam has focused on maintaining the one terminal format, although the original 1967 development was more than doubled in size by 1975. While the airport does not have Heathrow's dominant position in terms of passenger numbers (46.1m in 2006), it tops the league for runways. Five have been built since the first tarmac landing strip was laid in 1938. The latest, completed in 2003, was constructed on marshland four miles (seven km) from the terminal. 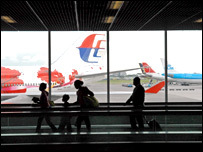 Its position is also intended to reduce noise pollution for Amsterdam and communities near the airport. With two terminals and three runways, Frankfurt's answer to a forecast growth in passenger numbers to 88.3m by 2020 is similar to that facing BAA at Heathrow. 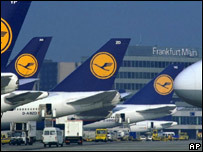 Fraport, who own the airport, want to build a new runway and a new terminal. And like Heathrow, the argument for the landing strip is to provide more slots for arriving aircraft and reduce delays. But the German capital Berlin - which does not have a major air hub the size of Heathrow, Schiphol or Frankfurt - is going its own way in providing a new rival. Berlin's Schonefeld airport, formerly East Germany's main hub, is being re-developed to become Berlin Brandenburg International. Its backers predict it will be able to handle 20m passengers a year once it is completed in 2011. The massive 3238 hectare (8000 acre) site at Roissy, north of Paris, is held up as either the way to develop a major international hub - or as a monstrous use of land in the name of aviation. Initially opened as a one-terminal airport in 1974 - Charles de Gaulle won plaudits for its cylindrical Terminal 1 design. CDG now has four runways, and three terminals, handling 56.6m passengers a year. 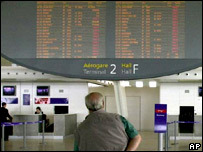 Recent figures suggest the runways are operating at less than 75% of their capacity, compared to 98.5% at Heathrow. Plans for a third runway at Heathrow are cancelled by the new government. Can a bigger Heathrow be green? Does Heathrow need third runway?